Explanation: Back in 1979, NASA's Voyager 1 spacecraft flew past Jupiter and its moons. 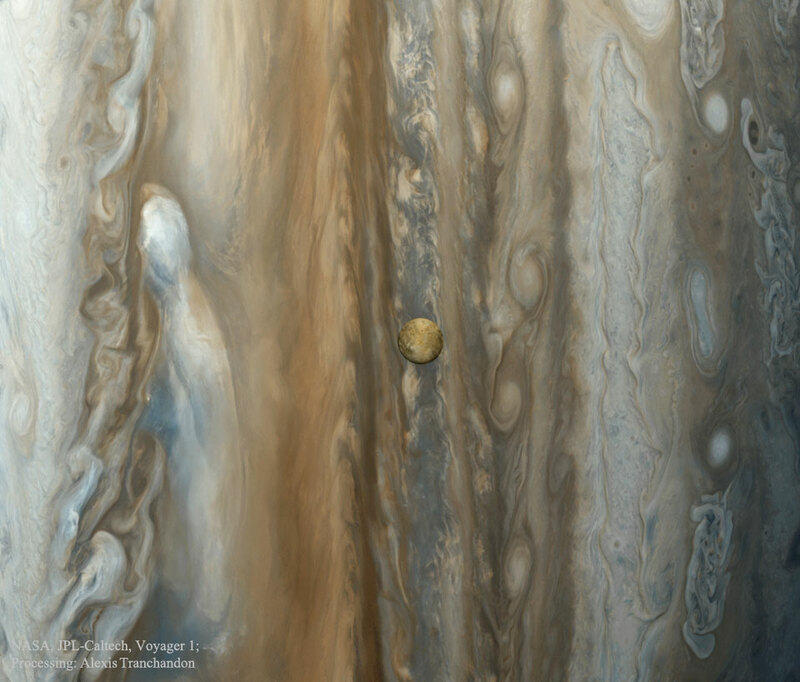 The images in this mosaic, featuring the moon Io against a background of gas giant Jupiter's diffuse swirling cloud bands, were recorded by Voyager's camera from a distance of about 8.3 million kilometres. The Io image from this mosaic may be the first to show curious round features on Io's surface with dark centres and bright rims more than 60 kilometres across. Now known to be volcanic in origin, these features were then thought likely to be impact craters, commonly seen on rocky bodies throughout the Solar System. But as Voyager continued to approach Io, close-up pictures revealed a bizarre world devoid of impact craters, frequently resurfaced by volcanic activity. Earlier this year a new robotic spacecraft, NASA's Juno, began to orbit Jupiter and last week made a pass within 5,000 kilometres of Jupiter's clouds. During the next two years, it is hoped that Juno will discover new things about Jupiter, for example what's in Jupiter's core.